“Peak week” is here at our elevation (2,300 feet) and might just last longer than 7 days. Driving, bicycling, hiking or walking around Asheville, Black Mountain, Montreat and Old Fort provide absolutely gorgeous views. Huge swaths of trees in rich hues of red, orange and gold (and still some green, too, not to mention the evergreens) cover the mountains all around. This morning, with an Autumn chill in the air but crystal clear blue skies, we attended the Point Lookout Trail ribbon-cutting ceremony. It looked like 100-200 other guests were there as well, many of them making the trek by bicycle. 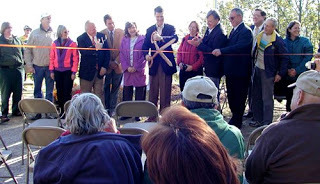 Members of the NCDOT, the McDowell Trails Association, state government, the U.S. Forest Service and the private landowners at both ends of the Trail took part in the ceremony. According to Bill Hendley of the McDowell Trails Association who gave a great talk about how, as a young boy, he dreamed about being able to ride his bike one day on this stretch of road, Point Lookout Trail is the first completed link in what will be a six-link greenway in the area. If you’re in our neck of the woods, places we’d recommend you visit this week include Point Lookout Trail, of course. You might also check out Biltmore Estate and the North Carolina Arboretum, both of which have great views of the fall colors and a variety of trails to take it all in. 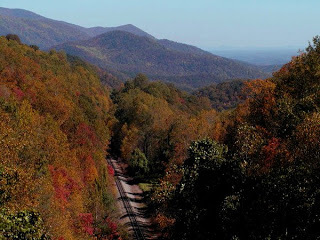 Or sit back and enjoy the fall colors of Asheville on the Grayline Asheville Trolley Tour. Trolley tours take you through historic districts like Grove Park and Montford, as well as the River Arts District and Biltmore Village. 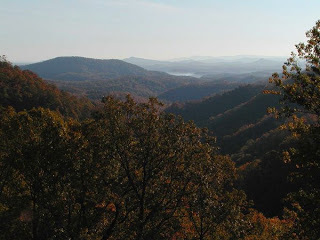 This entry was posted in Uncategorized and tagged Asheville, Autumn / fall foliage, Biltmore, festivals and special events, hiking, Old Fort / Andrews Geyser by Inn on Mill Creek. Bookmark the permalink.